How Can Pregnancy Affect Your Skin? Pregnancy is one of the most beautiful and empowering experiences a woman can go through—except it can also be one of the most challenging, frustrating, and confusing experiences of your life. There are plenty of valid reasons why we glorify pregnancy and adore the experience, but that doesn’t detract from the fact that pregnancy creates a lot of changes throughout the body, some of which are expected, and some of which are total shockers. One of the changes that many women are not expecting to have to deal with during pregnancy are the changes to your skin. Pregnancy can really take a toll on your healthy glow! From hormonal fluctuations and acne breakouts to black spots and blotchiness, it is hard to predict what changes you may experience while pregnant. It’s smart to stay informed about the potential changes that pregnancy can cause to your skin so that you aren’t taken by surprise. Breakouts. Remember when you were a teenager, and hormones caused your face to start breaking out? Well, acne can return with vengeance during pregnancy—and the acne isn’t limited to just your face. It isn’t a surprise that hormones are going to go crazy during pregnancy. Protect your skin by adopting a healthy and gentle cleaning routine. [REMEMBER, NOT ALL MEDICATIONS TO TREAT ACNE ARE SAFE DURING PREGNANCY, SO BE SURE TO DISCUSS WITH YOUR DOCTOR BEFORE STARTING ANYTHING NEW]. Dark Patches. Almost half of all pregnant women develop dark patches (melasma) during pregnancy due to increased levels of pigmentation. The dark patches frequently develop on the face or neck, and may resemble a birthmark. Sometimes called the “pregnancy mask,” these dark spots can be medically addressed after pregnancy, but in the meantime you can keep the darkening to a minimum by reducing sun exposure and using sunscreen frequently. Sensitive Skin. Even if your skin is notoriously resilient, pregnancy can make it hypersensitive. Be prepared for occurrences of rashes and hives, and pay attention to how different environmental factors may influence your skin. Pregnancy is likely to cause your skin to go through a number of changes, but not all of those changes are necessarily going to be bad. Many women develop what is known as the pregnant woman “glow,” with skin that is vibrant, healthy, and full of life. Whether as a result of estrogen spikes or fatigue, pregnancy is most certainly going to start to show on your skin. Be prepared for the changes and take steps to prepare your skin for what’s to come to help keep your skin as healthy as possible. 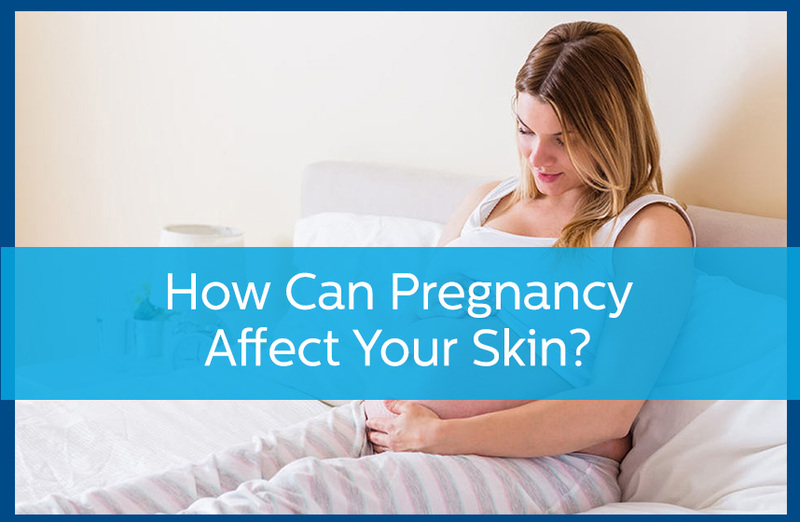 For more information on how pregnancy affects your skin, contact Avail Dermatology today at 770-251-5111 or schedule an appointment with us. https://availdermatology.com/wp-content/uploads/2018/08/PregnacySkin.jpg 560 858 Michelle Lee /wp-content/uploads/2017/08/logo.png Michelle Lee2018-07-20 17:46:112019-04-17 20:04:39How Can Pregnancy Affect Your Skin?